Learn the Conti approach to advanced re-harmonization of your chord melody arrangements to achieve a pro-level sound. Considered by many pro guitarists and pianists as the “go to” resource on the subject, this is another best seller now enhanced with 6 hours of DVD video! Learn The Formula, the Conti approach to advanced reharmonization of your chord melodies to achieve pro-level sound. Considered by many pro guitarists and pianists as the “go to” resource on the subject, this is another best seller now enhanced with 6 hours of DVD video! First, Conti reduces what is generally viewed as highly complex subject matter to a handful of quickly comprehensible guidelines. 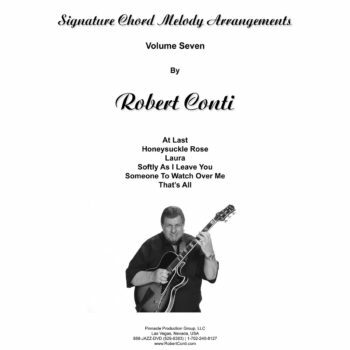 Next, through a series of examples, Robert clearly demonstrates his Formula to create the reharmonized pro-level arrangements as seen in Just Jazz Guitar Magazine, the Play Pro Chord Melody Today DVD Series and his Signature Chord Melody Arrangement books. Learn his methodology and you’ll be amazed when you hear the results you’ll begin to accomplish very quickly. Conti teaches The Formula! Then he presents 4 SOLID HOURS of the “How To Nuts & Bolts” with numerous ideas and examples. Within the first few chapters of this Book and DVD, any upper level intermediate student will learn exactly how to begin creating stunning Pass, Peterson and Tatum type substitutions and reharmonizations for any standard, simply by learning Conti’s Formula to manipulate the most basic elements of harmony with ease. Robert spends ANOTHER 2 HOURS to present the viewer with 3 full length songs that further demonstrate real world applications of the methodology he taught on Disc One. You’ll soon understand why thousands of savvy jazz guitarists and pianists rank The Formula! as the ultimate methodology book on the subject of reharmonization. We are frequently asked the difference between The Formula and The Chord Melody Assembly Line. Simply, The Formula teaches more advanced concepts in reharmonization. If you’re just starting out with wanting to create chord melodies from a lead sheet or fake book, start with The Chord Melody Assembly Line instead. 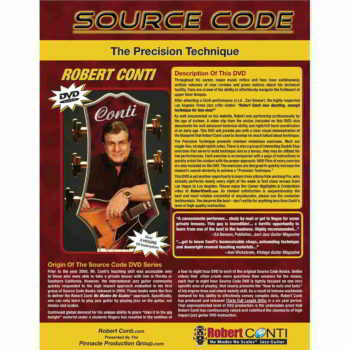 At $39.95, you now have access to Robert Conti’s knowledge at under $7.00 per hour of professional instruction in this information packed DVD – an unbeatable price worth many many times the cost of admission! Conti’s The Formula represents an uncommon way to get through the chord melody universe, but it made me understand some concepts that I could use to make my first arrangement. 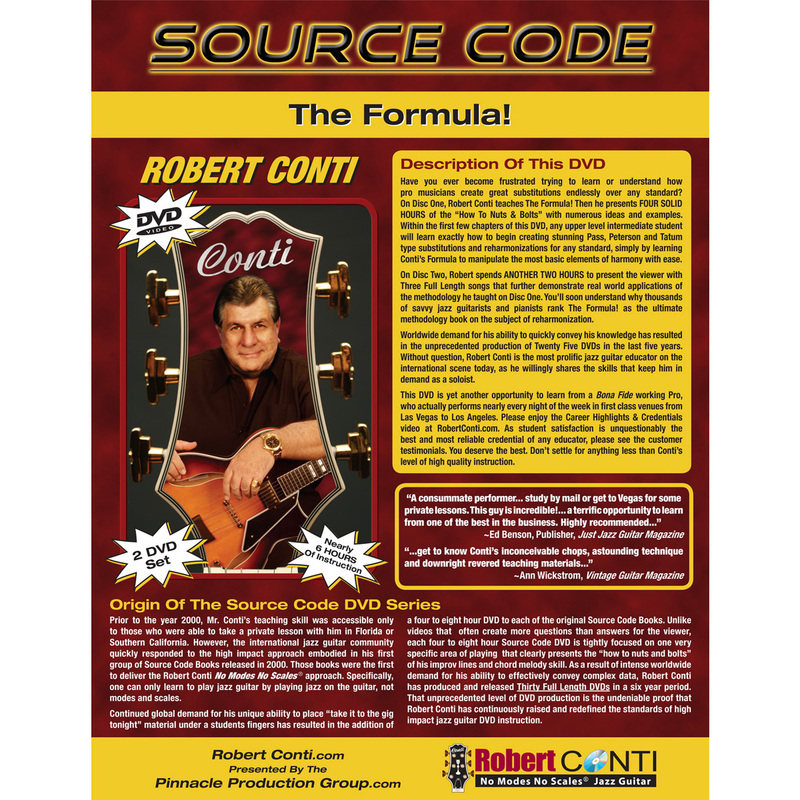 After reading The Formula I knew not only were Mr. Conti got the chords from (in his Signature Chord Melody Arrangements series), but I can create chord melody by myself. If you told me this before, that I am able to this, after understanding the system, I would not believe it. Thank you for what appears to be another great year or so of learning and refining coming up. I believe it was around May 2011 when I first received the Chord Melody Assembly Line and The Formula (and the rest of the Source Code series). So, after about a year and a half of regular (and delightful) learning, studying, absorbing and playing, e.g. working out things in all keys, playing lots of tunes, etc. I have done in that year and one half what I am relatively certain I NEVER would have accomplished without your Chord Melody Assembly Line and The Formula. Your books provided the switch that turned on the light for this style of block chord type chord melody playing. A great book that I haven’t fully absorbed – the freedom and creativity it enables is mind blowing! I learned more about chord melody and reharmonization from this one book and DVD set (The Formula) than all the many books and DVDs I have purchased before. I really enjoy Mr. Conti’s straight-forward no fluff approach. I found I already knew the answers to my questions I just didn’t know I already knew. Thanks again for all your help. Perhaps sometime I can meet Robert, but until then his lessons by DVD have changed my guitar playing forever. The deeper I get into your teaching method the more fascinating it becomes. The Formula has opened a whole new way of harmonizing and voicing chords and has been the bridge between my old Bach harmony mentality and spicing up any progression I run across. My ear is becoming accustomed to dissonant harmony and now I find that stock diatonic chords are becoming quite boring. Some of the local pickers have noticed my recent tendency to get “a little adventurous” with chord progressions, so hopefully we can get ’em off their butts and get with the Source Code program. Thanks again for the priceless inspiration and friendship. Carol Kaye referred me to Robert Conti. I watched all the videos on the web site. Bob Conti is truly a phenomenal player. His speed, articulation, melody, harmony, taste and warmth are truly amazing and gifted. He also comes across as very humble and friendly. For him to also be such a great teacher is extraordinary. What a blessing. Playing jazz is the way to learn jazz and after 45 years he is the first to actually give me jazz to learn. I buy 100% into Mr. Conti’s philosophy and teaching methods. So I am thrilled with my purchases, this the absolute best material I have ever purchased. Just wanted to thank you for the great job you did with writing “The Formula”. I can’t tell you how much that information helps me to arrange and thereby get a better understanding of how music is “created.” It has to be the most instructional piece of work I have ever read. Years ago I knew because of my schedule I would not be able to join a group. Chord melody compositions and composing was the only option left to me. I listened to guys like Joe Pass and some of Bob Conti’s music and realize that it is possible to play by yourself and create very pleasing and professional sounding music. I am an amateur and enjoy learning more than actually playing with a group. Your courses have radically increased my music knowledge and appreciation.